"Love the French way, it's that I love you, I love you, I love you, I love you"
The French Final was held on March 6th at La Plaine St-Denis TV Studios in Paris, hosted by Julien Lepers & Tex. The winner was chosen by a mixture of televoting and an "expert" jury in two rounds of voting - the first to select the top 2 and the second to select the winner. 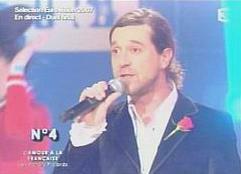 Les Fatals Picards came equal 22nd at the ESC.